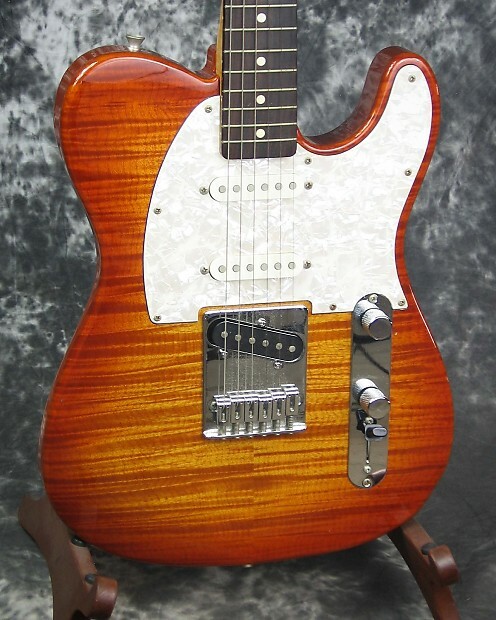 1995 Fender 90's Telecaster Deluxe Foto-Flame in rare natural flame grain!!! Only a few came with the natural grain , as most came with the red grain. I upgraded to pearl topped knobs, a Fender "F" neck plate and had Holland Michigan's finest guitar tech/luthier, Randy Perkins, put in a smokin' hot Seymour Duncan 'lil' 59 humbucker at the bridge. Has the 5-way pickup selector switch. This guitar is the coveted high-quality made issue, manufactured at the Fuji-gen plant in Japan. 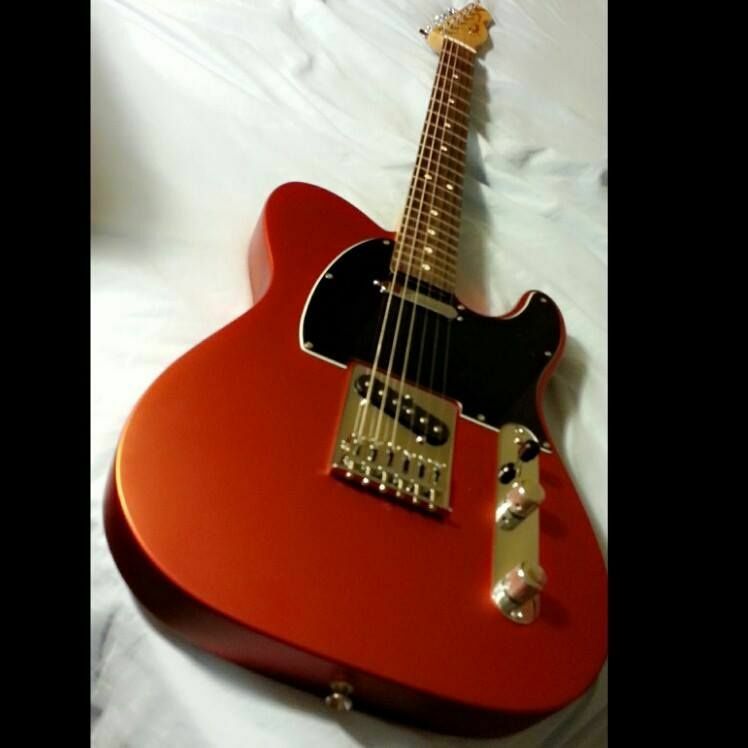 It has a sweet, fast 62 profile neck and a nice and tight neck pocket on the body. The beautiful rosewood fret board looks like dark Brazilian rosewood, but is not. 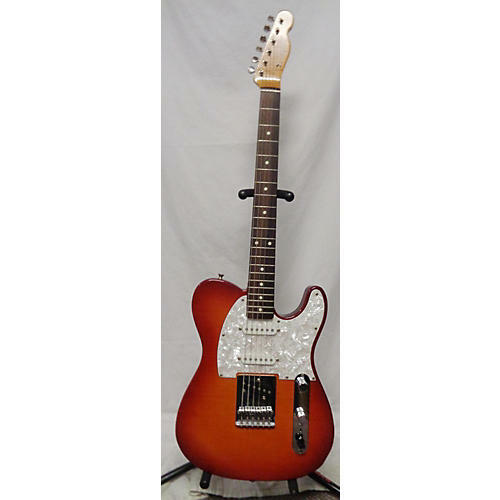 It comes with an exact copy tweed Fender hardshell case in excellent condition. 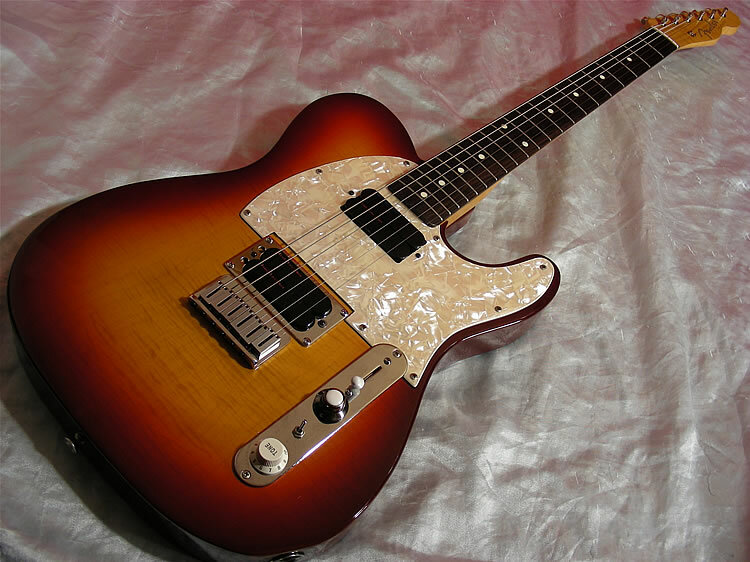 This guitar was only offered to the public for one year from Fender. 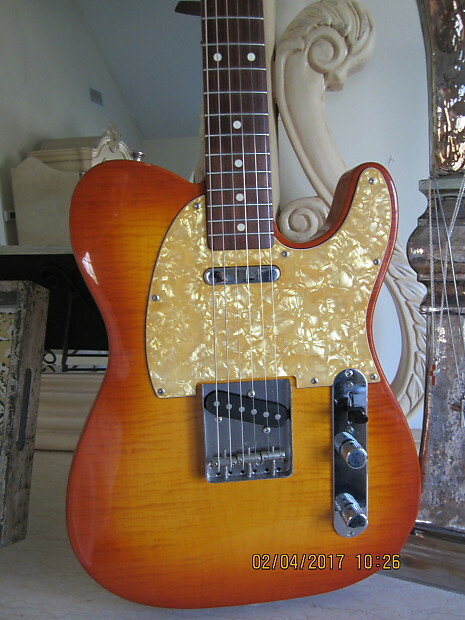 Fender stopped production on this model because they were outselling Fender's USA made Telecasters. This is why I scooped her up when I did. Note: Neck has not one, but TWO rare "Hamburglar faces" on it, along with one very rare "Monkey (Chimpanzee) face". Observe photos. I also have the original bridge pickup for an additional .00. The guitar is from my personal collection and has extremely low-low play time on her, since I own many electric guitars. She plays/sounds sweet and has excellent sustain. Overall the guitar is in excellent condition. An extremely hard to find collector's guitar in this fine condition! I am torn to part with her, but I must thin the herd of guitars, as I have too many. Jump on this deal before it slips through your fingers. Make sure you spend some time appreciating the Hamburglar Faces and the Monkey (well, more like a chimpanzee) Face... you don't see that stuff everyday. Please remember it's no fair bidding against me. I just posted the link for "educational" purposes. You should be glad I'm not planning to bid.... that's a beauty fro sure. Mind you, I bought a Japanese made Fender Precision Bass back in the early 90's - it played like an absolute dream but it was just so light there was (quite literally) no 'body' to the sound. The pick-ups weren't too bad but they were screwed in against a foam pad to adjust the height as against being set on the more normal screw thread for adjustment. LOL it was actually so light that you couldn't really play it standing up at all, the weight of those four monster machine-head assemblies made sure it was top-heavy. Your left hand was not only fretting the strings, it was supporting the weight of the neck! Mike, I've owned a number of made in Japan Fender guitars and each of them was excellent. The fit and finish are usually first rate. One of the biggest differences was the use of Basswood for body blanks. Basswood was shunned by many traditionalists as being inferior to Alder or Ash. I don't agree with this at all. Many high end guitars have Basswood bodies today. The pickups in MIJ guitars do show a lot of variation. I've had then with flush poles and ceramic magnets or staggered poles with AlNiCo pole pieces. In the case of the guitar you show I couldn't say. At least one pup is changed. The only components I usually need to change are the input jack and selector switch because they are very cheap and usually get noisy. I think I read somewhere that the Bass trees grow right outside the Fuji-Gen plant. I'm trying to figure out if I can swap out the fotoflame on that one for zebra wood. If you have the money, somebody has the parts. Kind of like X1, options are always available. Ha! You can't stop me! I'm going to put in an unbeatable bid! Mike, ifI were going to spend 1k on a guitar I had never played I would assume nothing as far as the return policy. 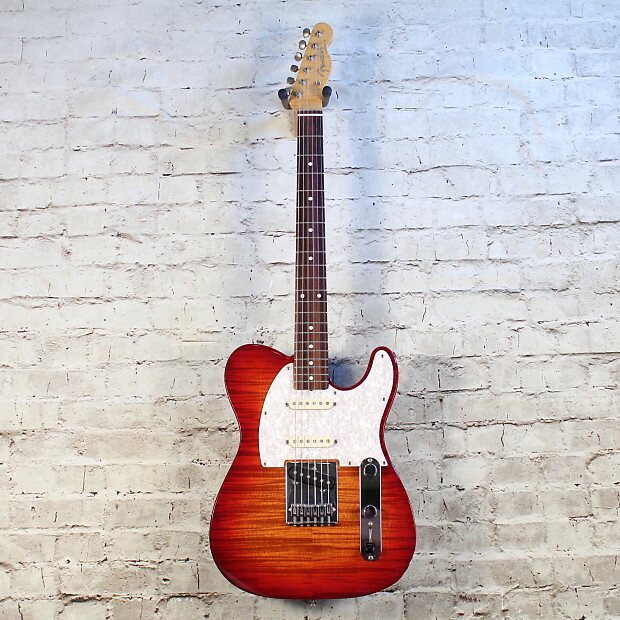 If I were you, and if I were to buy some guitar like this with a 7 day return policy I would make sure that it is understood that the 7 days start when you sign the delivery slip AND that yu can return it for any reason. There does not have to be something technically wrong with the guitar but you can return it "no questions asked" in case you get it and for some reason you can't quite explain... don't like it as much as you thought you would... but that is just me, I find it better to have a frank, blunt understanding up front. Then there is no room for some friction if you decide you don't want it but can't quite explain why. That is a lot of bucks for a guitar you've never held and played. If any problem might arise, please contact me. Thanks. Question is, how does the seller define a problem? and does it matter or are returns unconditional... find out. I would try to buy it for 900.00 it don't hurt to ask or at least get the the seller to pay or split the shipping. He sounds honest but I wouldn't assume anything. Yes, I am cynical but with good reasons to be. I'm sure you know what I mean. We used to hve a handshake and a deal. Dang, I sound like a cheap date scape skate... oh well. It is purty but beauty is skin deep, especially in a photoflame. 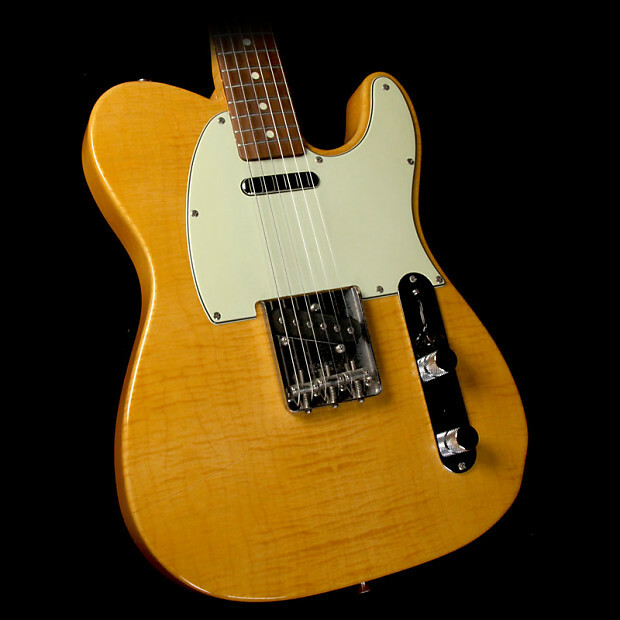 Heck, it may be worth a grand, in 1952 a new Tele sold for 9.00 , that translates to 18.19 in 2011 dollars. Is it a good value? My Fender Strat is a 1985/86 Japanese with custom single-space humbucker, with an extra 3-way toggle for the humbucker, and active circutry. I paid 9 new for it in 1986 (had a Fender connection at the time). The mods cost me 0 (IIRC). Earlier this year I had the bridge replaced (and remove whammy ability) and added rear access for the battery. I used to have to nearly remove the pickguard to replace the battery. Probably worth nothing to anyone but me as it was my first non-Bass Fender. I have two Japanese Fenders. A black Strat and a red Tele. I got them both back in 84 IIRC. I've played many guitars since and none, not even American made ones have had the same feel or sound. I just looked at the eBay add and fell off my chair. Everything I've said about Japanese Fenders still stands, but that guitar was only about 0 when new. AFAIK Fotoflame has never been considered rare or collectable so this guy is gouging big time. Great guitar and very cool but not worth ,000. It looks like he wants a couple hundred per hamburgler face. Yes, I feel a bit awkward at this point. My "Onion" joke seems to have gone awry. I am entertained by the idea that some folks, and I assume it's a small cult, are creating a myth about the merits of plastic wrapped guitars. Not that there's anything wrong with that. If you feel somewhat bemused by the idea, as I do, then the sellers description becomes incredibly funny comedy... so I thought I'd pass along the fun. Now, I did actually learn something. I have been aware of foto flame since it came out but I never, ever, imagined that the necks were shrink wrapped as well. It amazes me to think that every one has the exact same flame maple neck... it seems surreal. My very first guitar was a Fender MIJ Squire that I bought for 5 in 1982 (I was a late bloomer). It was really nice. I sold it 2 years later for 5 and bought a used MIA 1982 American Standard for 5. I don't have anything against foreign geetars... but I only have one non-domestic guitar (A rather deluxe Hondo 32 fret Danelectro Guitariln copy, probably made at Fuji-Gen) and the rest are all USA made. I stated elsewhere on the forum today that I enjoy the fashion aspect of wearing a MIA guitar. I know.. I'm shallow... and it's probably why I can't afford fancy socks. I apologize to anyone who doesn't think it was funny... and I am glad that some of you do. I think the French call it 'decoupage'. I also think that the 'Hello Kitty' finish is a better example than 'Hamburglars'. Didn't they start the flame effect finishes? In which case an eerie coincidence I'd say. Wow! That Shirley is purdy! Why yes..... yes it is. This is the one I have, only the left handed version. Paid 5 for it IIRC. The guitar hasn't been played in 8 years. The guy doesn't play, he just collects. The guitar "has never been played by me". The case costs extra... but he has it. I guess he is a case collector as well. And he assures us that this thing is the best of the best. More power to him. I hope the buyer is absolutely thrilled. I may have a new ebay past time... I used to just satisfy my curiosity by figuring out what obvious mods were made to the many "dead mint" vintage amps for sale on ebay... doing so allows me early opportunity to recognize the actual dead mint ones that show up on rare occasions at a price I think makes for an actual good deal. Reading Fuji-Gen guitar listings may prove to be far more entertaining... these two have some of the funniest ad copy I've read in years. Was it her soldering skills or simply the way she trimmed the grille cloth? The gal had her mojo working? I do agree that there are fantastically made Japanese guitars... but I think what happened was that by the late 1980's Japan was a first world economy and the cost of building excellent guitars became so high that when combined with the cost of shipping the expense finally ate away at any profits you could earn in the USA market if the product was to be positioned as an "import" priced product. Many Japanese manufacturers opened their own factories in Taiwan, then Malaysia, then South Korea and finally China opened up. The Japanese companies did this to save the expense of building in Japan... which is, as I say, a first world economy. Japanese companies like Ibanez continued to build first class guitars for their own brand identity... and they started costing k USD and that was that. 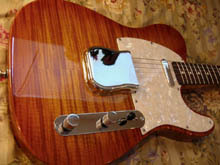 Fender opened the Mexican plant simply to keep a supply chain of price point guitars available. I've given several nieces and nephews Mexican Stratocasters as gifts... and after playing them I felt that I could enjoy playing one of them any day of the week. I have found that while helping friends with the first batch of Korean guitars that some are simply not able to be set up well. Intonation and nut placement is a nagging issue. Of course those issues are all fixed on the latest stuff and Korean guitars fill a niche for excellence at a very low price point. There seems to be something for every body. I'm having fun snaking great deals on lightly used USA custom shop guitars and it seems that every one I buy can be sold for more than I pay. I love me some guitars. So McQ... Should I buy a Mexican or American Fender? Am I the only one disappointed that the Hamburglar and monkey faces aren't stickers on the fretboard? You should buy what ever makes you happiest.